My thought process was to not go out into the craze after Friday night due to all the crazy people doing their last minute preparation. It’s now been three whole days that I have literally been in pajamas (I have changed and showered, I swear), watching ghost movies and shows on Netflix, and crafting. I’m getting the worse case of cabin fever you have ever heard. I literally have gone nuts… literally. I have stormed around the house for about 20 minutes complaining about our lack of kettle cooked barbeque chips and the fact that my mother brought home apple dumplings instead… I dislike dumplings… which thus led me to more distress. I’m not one to be cooped up for long periods of time… and now my house has started to shake from such high winds. Good lord, lets hope my room, which happens to sit under some very large trees, makes it through the night! To try and distract myself from my lack of escape (Maryland has literally forbidden us from driving… like at all) I decided to do a best methods post! To say I have a ton of glass ornaments is an understatement. I blame Michaels for having all these deals where they are concerned and if you haven’t been taking advantage of the 25% off ornaments yet, you are a nutter and should go do so immediately. 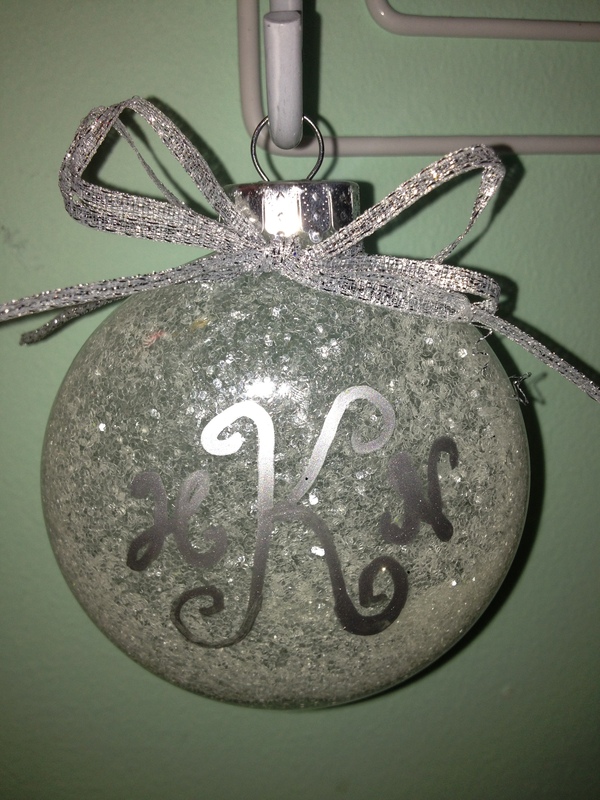 But now having done a fare share of glitter ornament, I have decided to share my favorite way of decorating them! 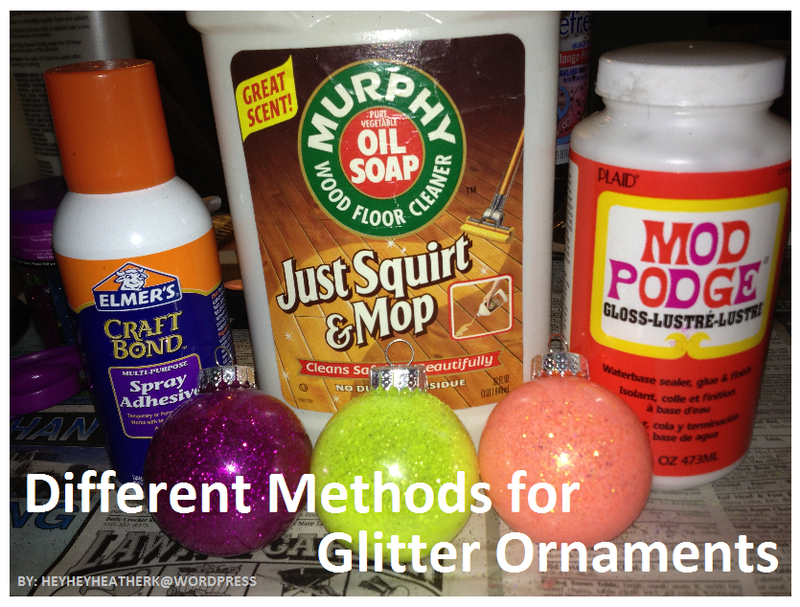 You’ve seen all of the methods for making glitter ornaments from the inside: mop and glo, mod podge, spray adhesive. But which is the best method? I have used all three now and am ready to share with you how they’ve ranked. 1. 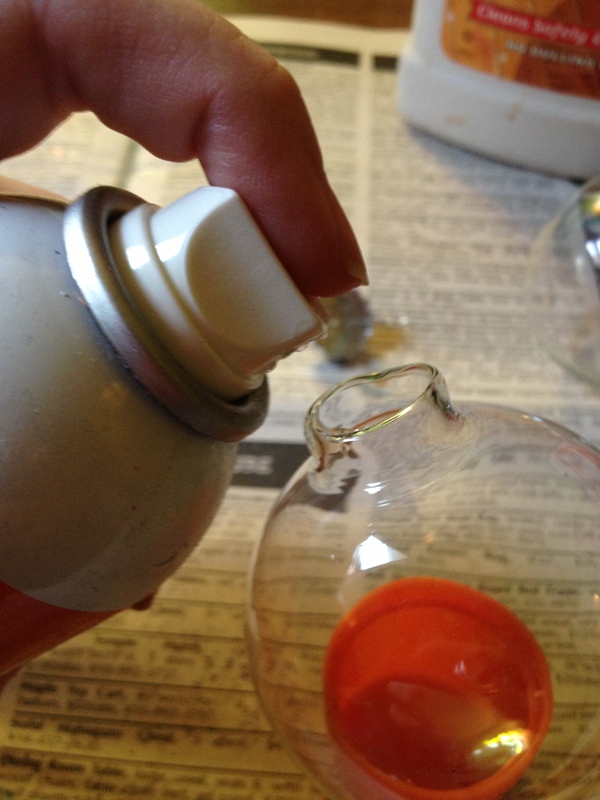 Spray directly into the bulb. 2. Twirl around excess spray. 3. 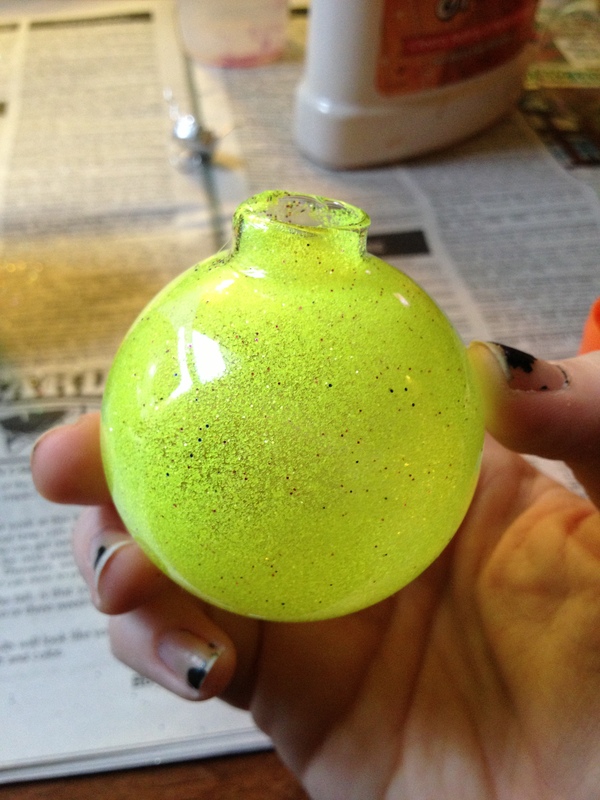 Pour in a generous amount of glitter and twirl around the bulb. 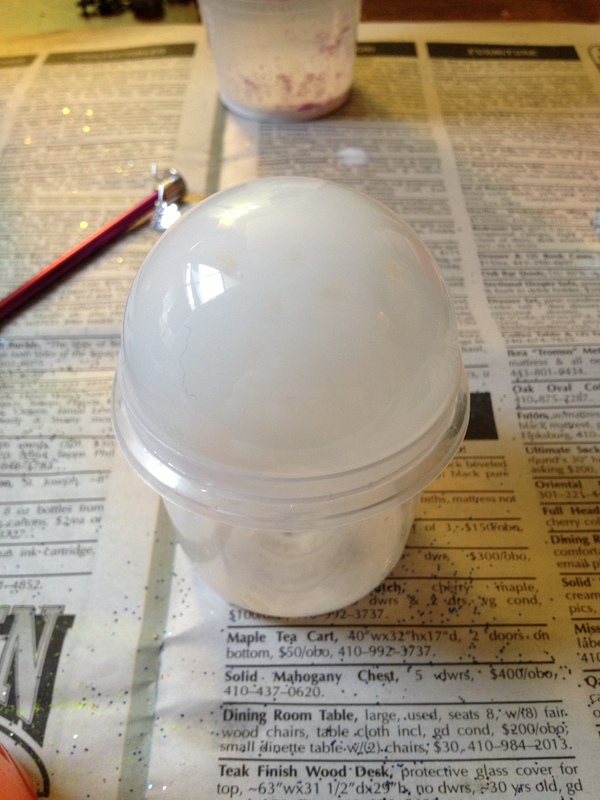 You can pour the rest out and back into the container once the inside is covered in its entirety. Ok, so this is easy peasy. 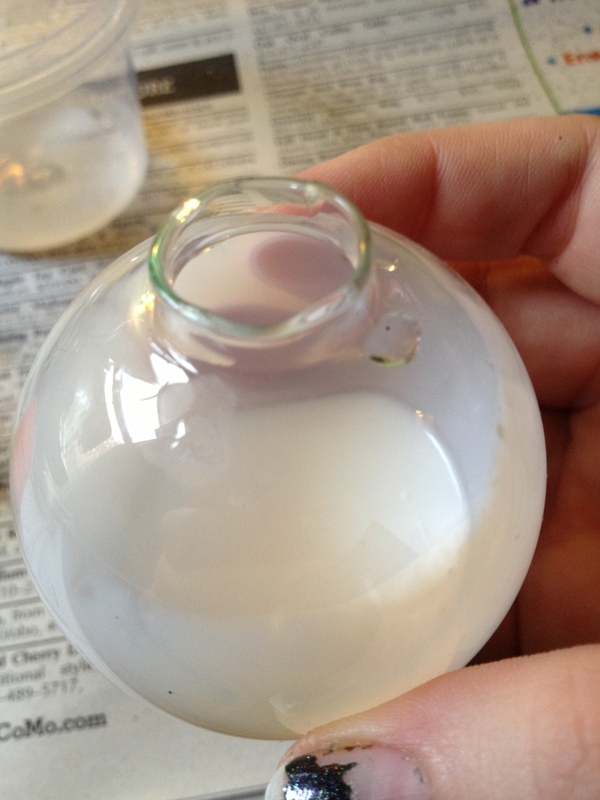 Just be sure to spray into the bulb and not to get it on the outside, because THAT is the most unfun feeling on your fingers ever. It’s like an aerosole version of super glue. 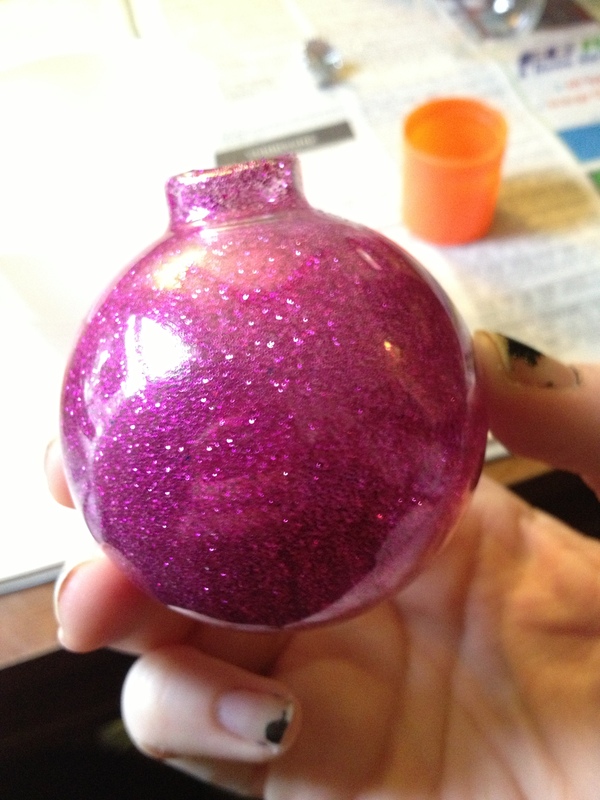 But it’s easy as spray, cover, pour in glitter, twirl to cover, and pour out excess glitter. 1. 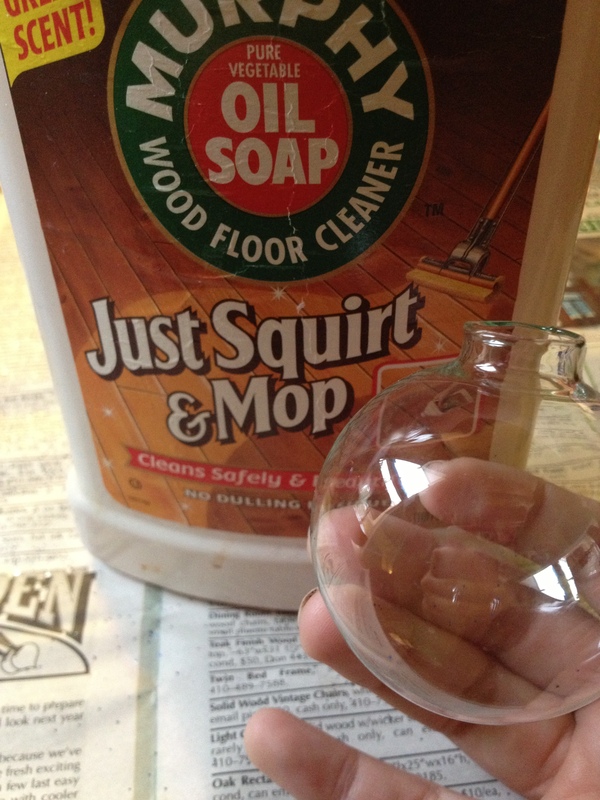 Pour a generous amount of floor cleaner into the bulb and swirl around. 2. Swirl and cover the inside entirely, pour out any excess. 3. 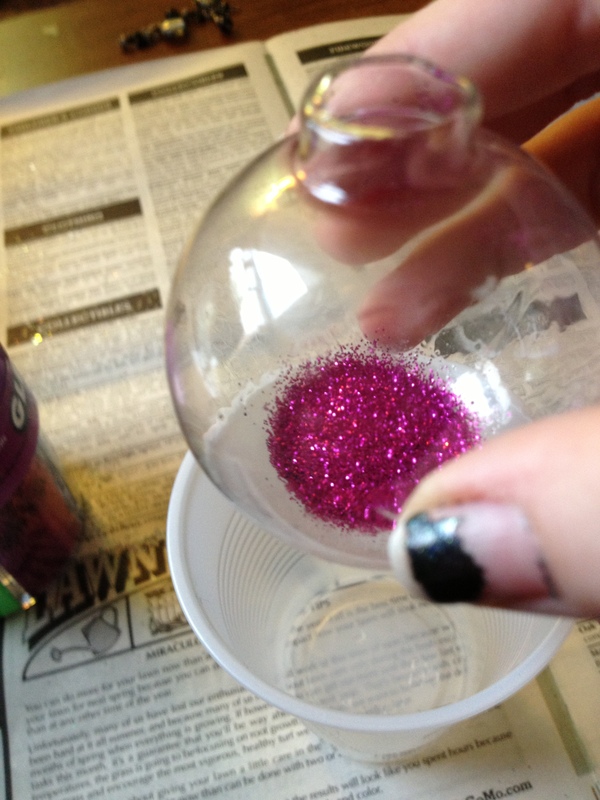 Pour in a generous amount of glitter… again, pour the excess out and back into the container. 1. 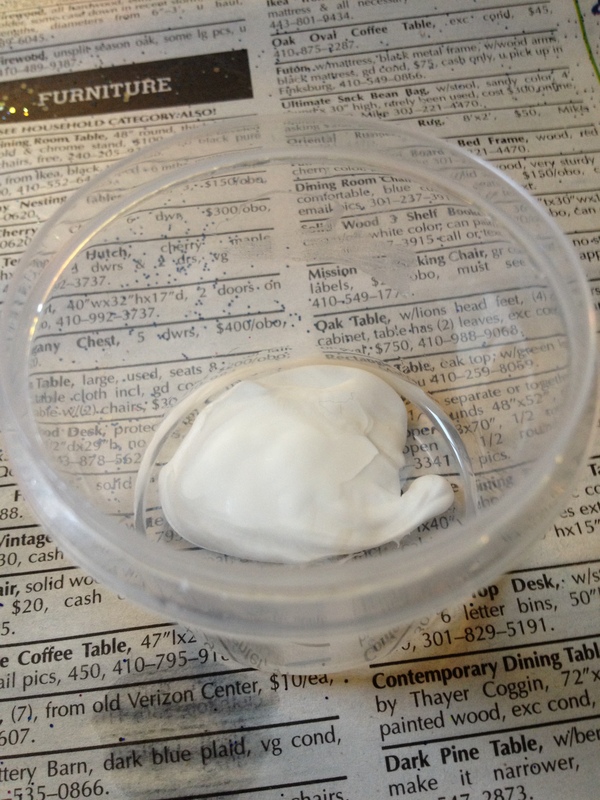 Pour a dollop of Mod Podge into a small container and mix with a tiny bit of water. 2. 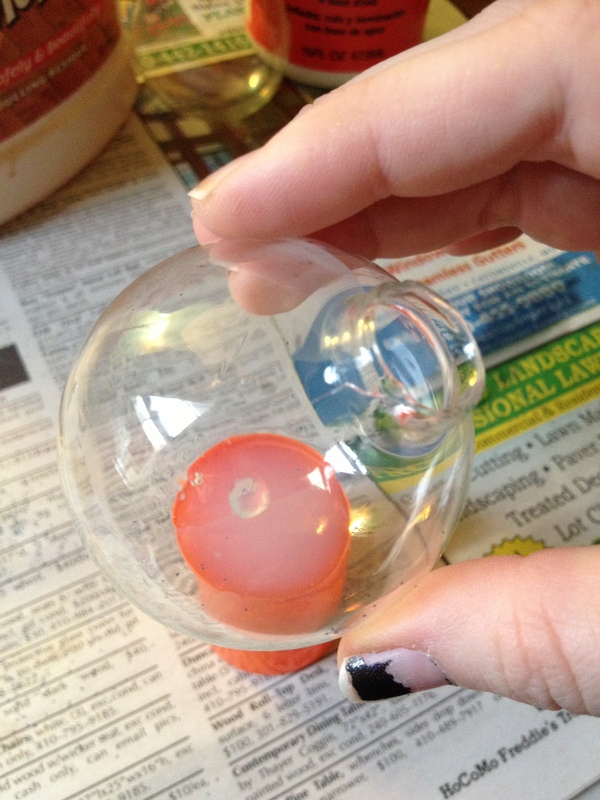 Pour the mixture in the bulb and shake to get the entire inside coated. 3. 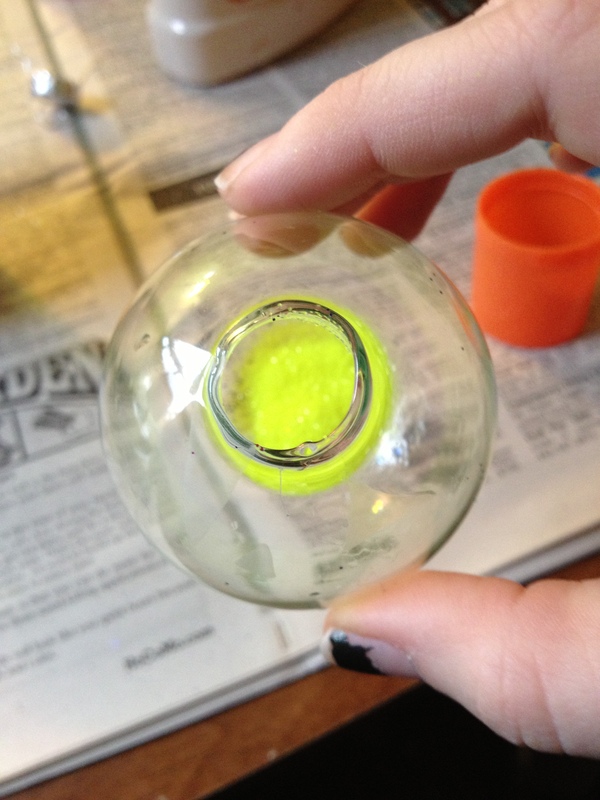 Let the excess mixture drain from the bulb. 4. 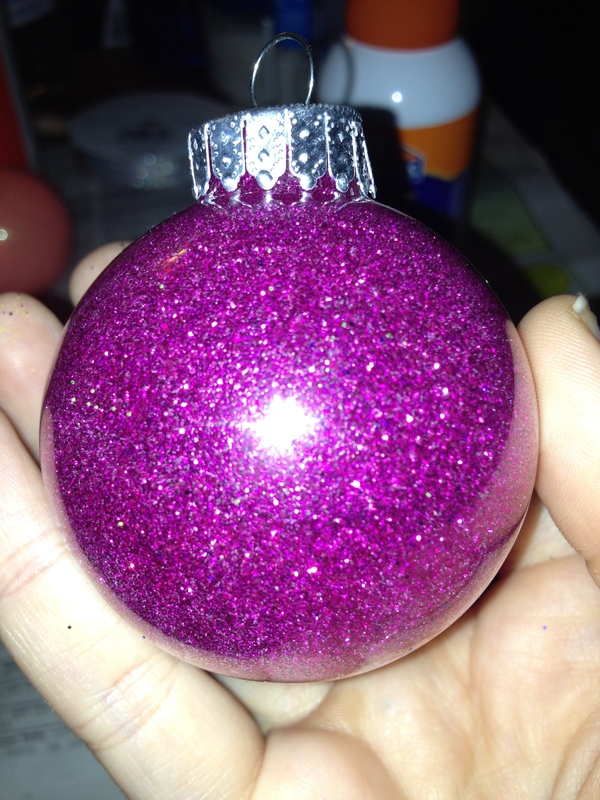 Pour in a generous amount of glitter and coat the inside, pour the excess back into the glitter container. 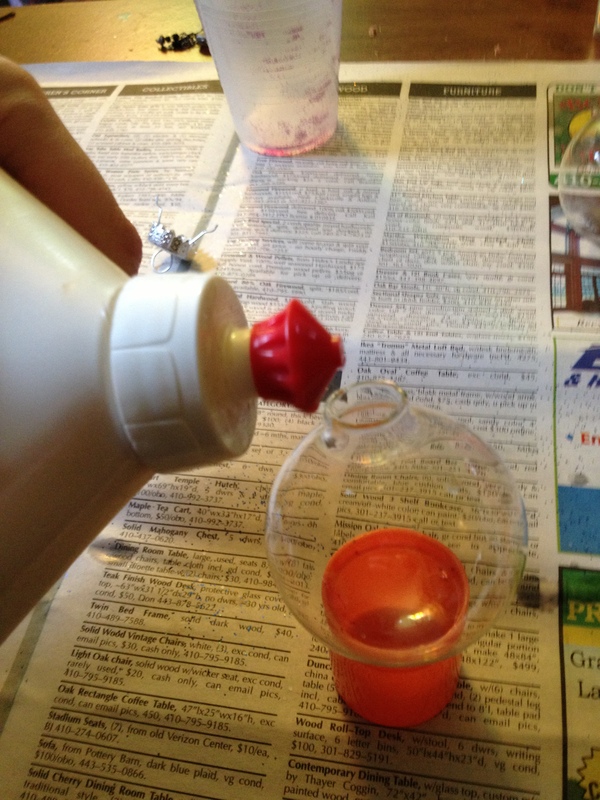 Adhesive Spray: I gave it 4/4 stars as it is the easiest to work with and the quickest method! It looks the cleanest too! 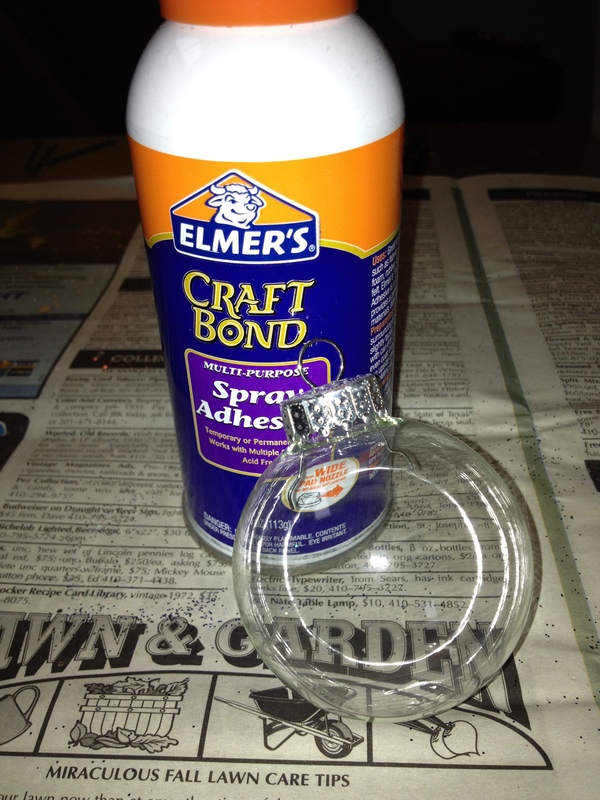 If you don’t have a can of Adhesive Spray, I urge you to get one for your crafting, it has so many uses! 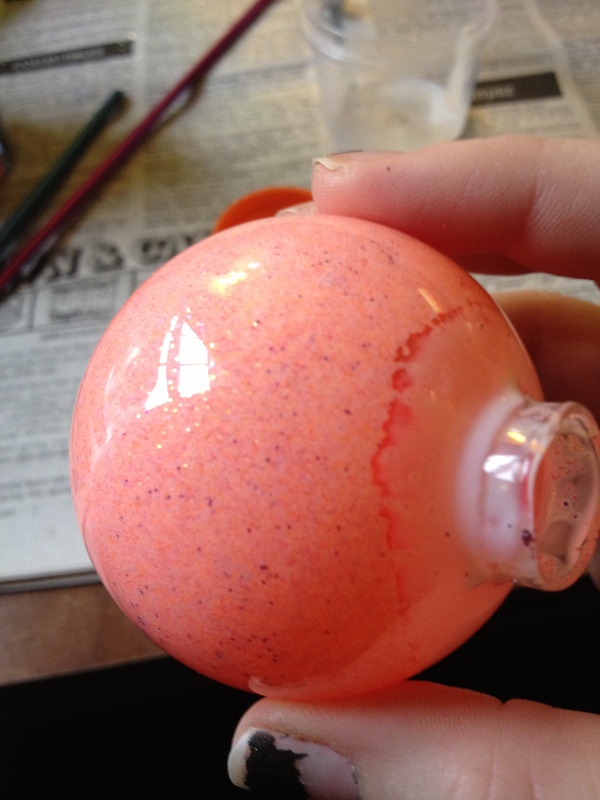 Mod Podge: I gave this one 3/4 stars as it is also easy to use but it takes AGES for the bulb to dry. You can see that even letting all of them dry overnight, only the top was dry and the rest was still wet. In a few days it will look closer to the first and I expect might be a bit sturdier. But if you’re looking for that immediate effect, I’d stick with the first method. 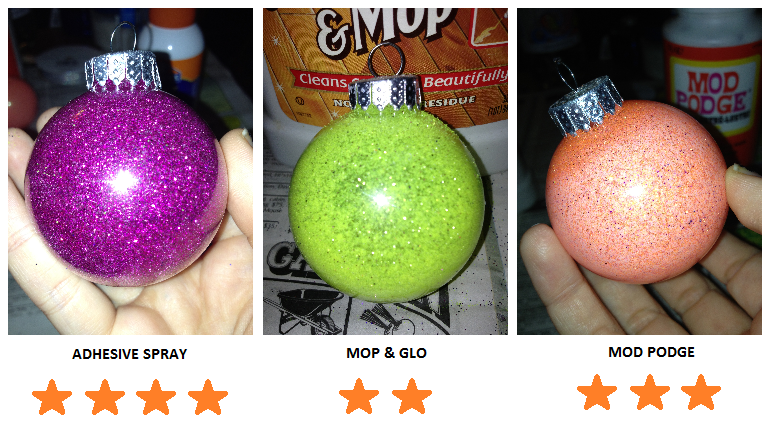 Mop and Glo: I gave this one 2/4 stars and I’ll tell you why. This method has taken the Pinterest world by storm and it is extremely easy! (It also smells pretty wonderful too). 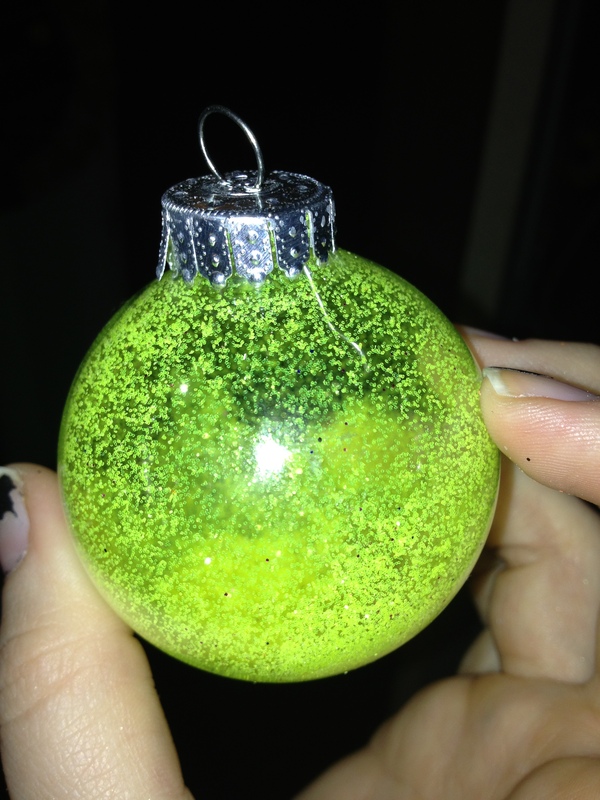 However, when I made these last year I noticed the glitter doesn’t stick after a while and the littlest drop will cause the glitter to fall off the side (see below). I was bummed by that. After dropping this one for demonstration, I attempted to do some adhesive spray to repair it, it just was not the same and looked messy. Above: Pre-drop Mop & Glo bulb. Below: Post-drop Mop & Glo bulb. 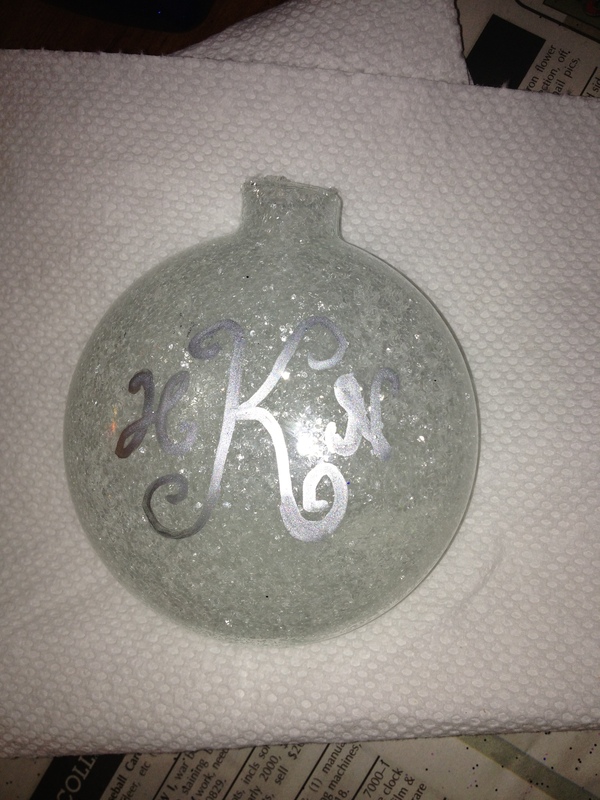 I also made another with the adhesive method last night (pre-hurricane) and put my monogram on it! Well, I await for my brownies to finish baking so I can divulge and continue to watch Doctor Who, because what is a natural disaster without the Doctor nearby. It’s starting to feel like the “Vampires of Venice” episode… I’m expecting fish people to pop out of no where. To all those who are along the Northeast, PLEASE be safe! This is really useful! 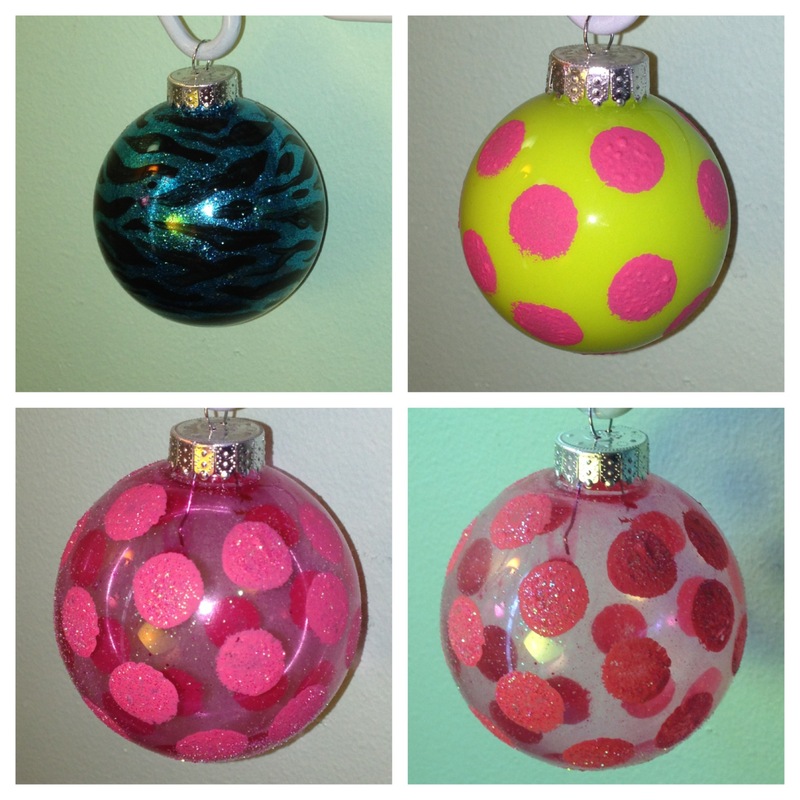 I did grab some ornaments from Michael’s that were on sale – I’ll have to grab some spray adhesive and glitter too! Soooo glad I found this! I purchased some ornaments this year with plans to make some fantastic glitter mickey and minnie ornaments for my mother-in-law…but I couldn’t find the Pledge stuff anywhere. 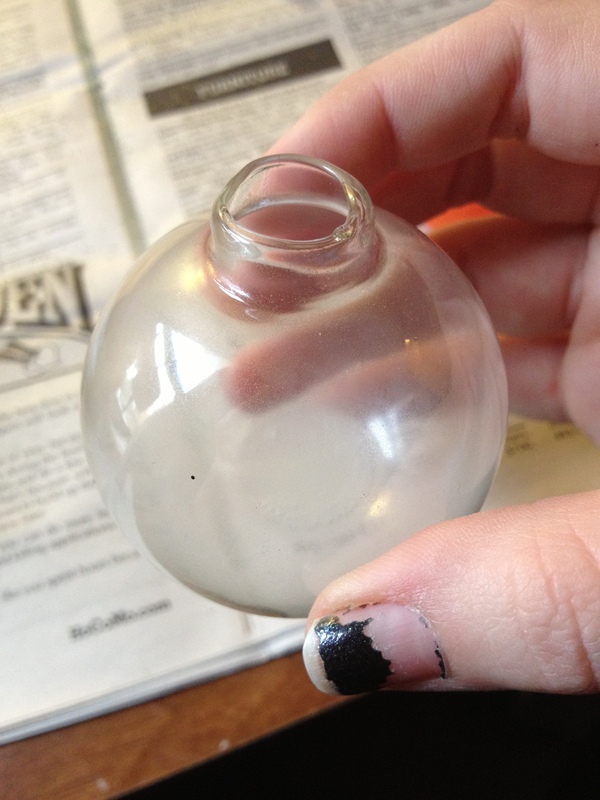 Plus, I started thinking, what a big bottle for only a small amount needed for my ornaments! And I don’t even have wax-able floors! Other methods I found (ink and pump-style hairspray) would require additional purchase for which I would have no other uses… But adhesive spray? I have two stinkin bottles leftover from wedding crafts! Yesssss!!!! 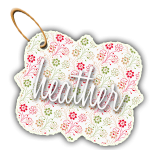 Heather, you’ve saved this Heather’s Christmas! Thank you thank you thank you! This is possibly the best comment I’ve ever received! 🙂 post pictures if you get a chance! Approximately how long did the modge-podge method take to dry? Did it dry nice and clear? 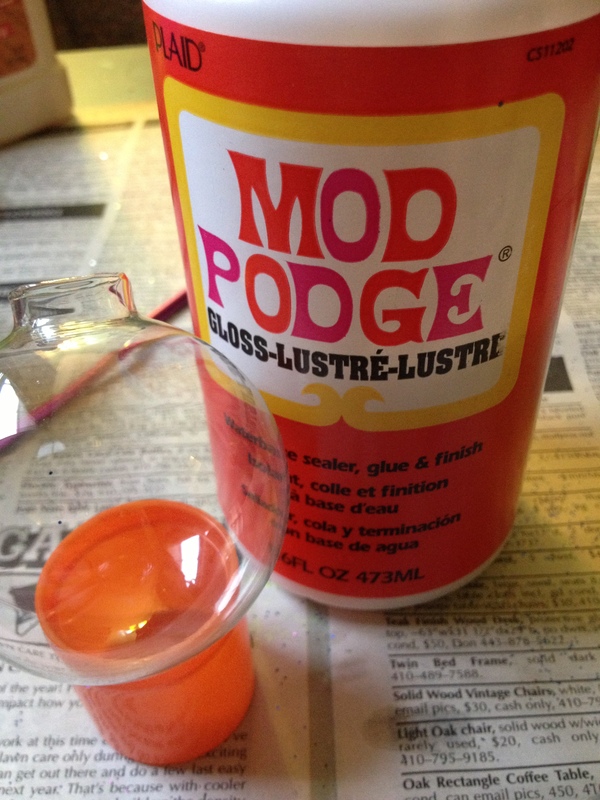 I don’t have adhesive spray or pledge so I will try the modge podge! Thanks for your crafty instructions! No problem, Connie! Glad they were helpful! 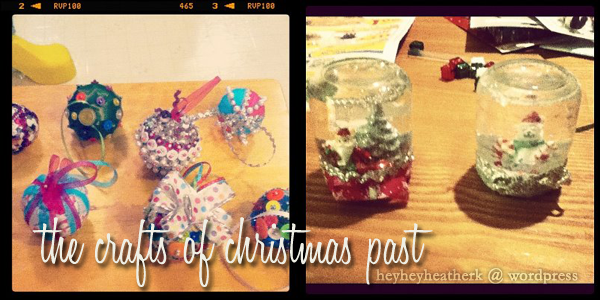 Has the glitter come off of the ones that you did with adhesive spray and/or mod podge? Nope! 3 years later and they are still completely covered! Hello, I am wondering how the three ornaments held up over time. Would you still say the adhesive spray method is the winner? I know this over three years later but each has stood the test of time! The mod podge and the spray adhesive still look new! Pingback: 8 of the Best Last Minute DIY Christmas Decorations to Merry up Your Holidays - What the Doost!? 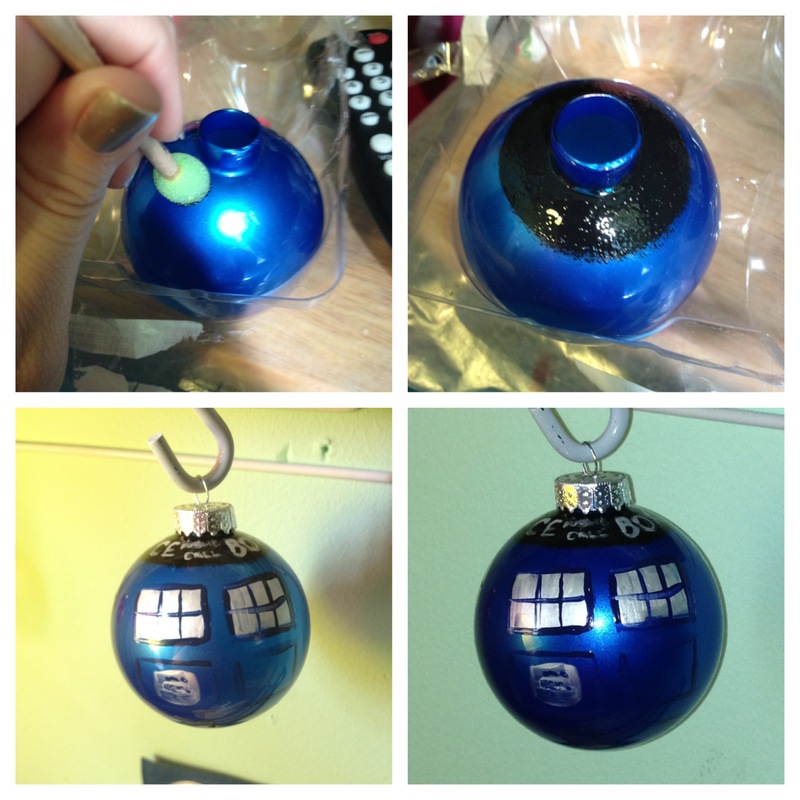 I just tried this with spray adhesive and had trouble getting the glue to coat the entire inside of the ornament. I didn’t use the same brand. Did you have any issues? I wonder if I add a little water if that would help or hinder the process. 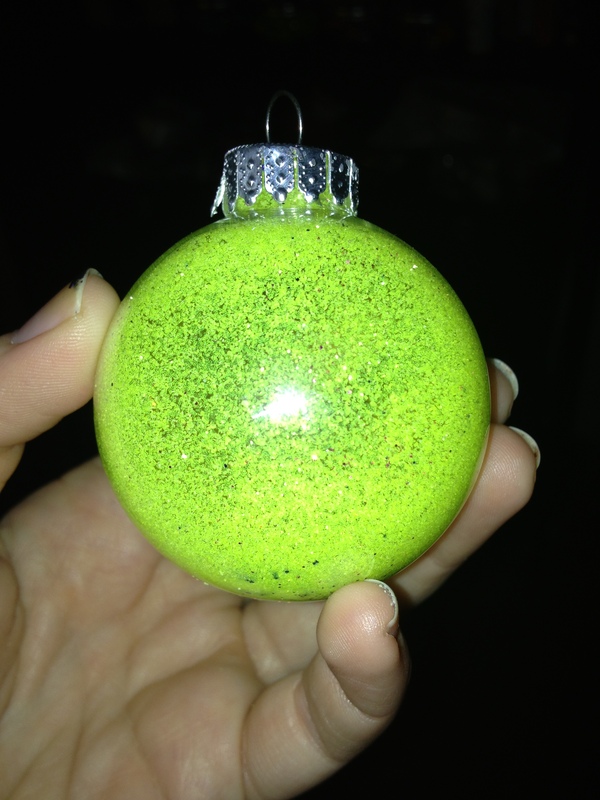 I just did the modge podge with black glitter but the ball is pretty white. Will it dry clear and make the glitter shiny or will it stay white?